Slipping and sliding on algae covered rocks was not what I had envisaged when I signed up for Sundown Diving's "Snorkelling with the Seals" tour, however this was definitely a unique way of exploring Snake Island. Soaring over the sparkling Salish Sea on a seaplane was an incredible start to the experience. The 20-minute scenic flight departed from Vancouver's Coal Harbour. 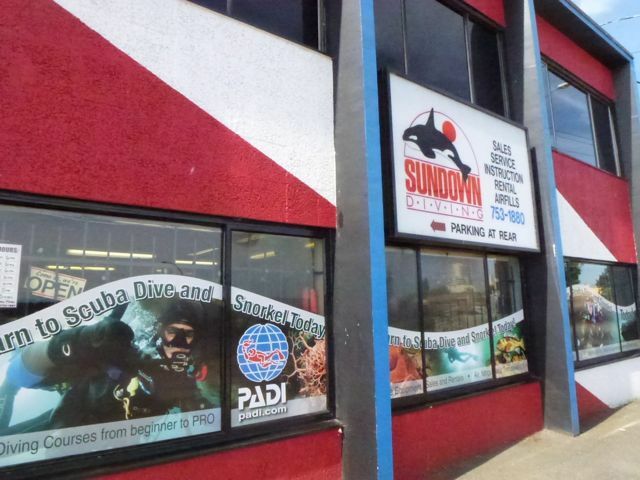 Sundown Diving is located in Nanaimo, on the east coast of Vancouver Island; a 10-minute walk from the Nanaimo seaplane terminal. Once we were fitted out in 7mm thick wetsuits, vests, hoods, boots, gloves, snorkels and flippers we were driven a short distance to the boat harbor. 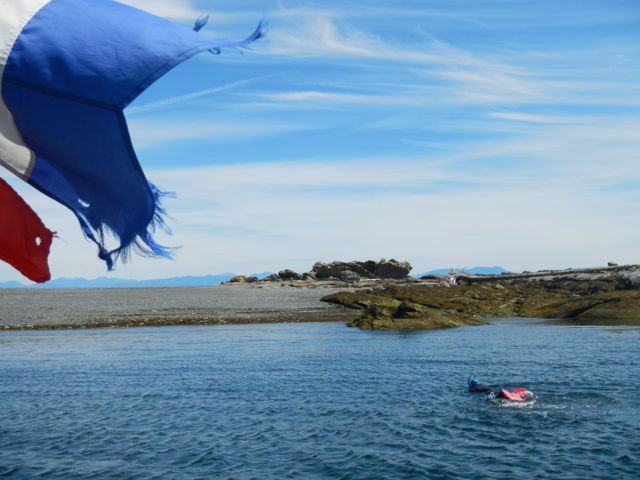 Vancouver Island is known to be one of the best cold water diving destinations in the world so I was pleased to be rugged up. Eight participants fit snugly in the boat and we sped through the water on the 15-minute journey to the uninhabited island. 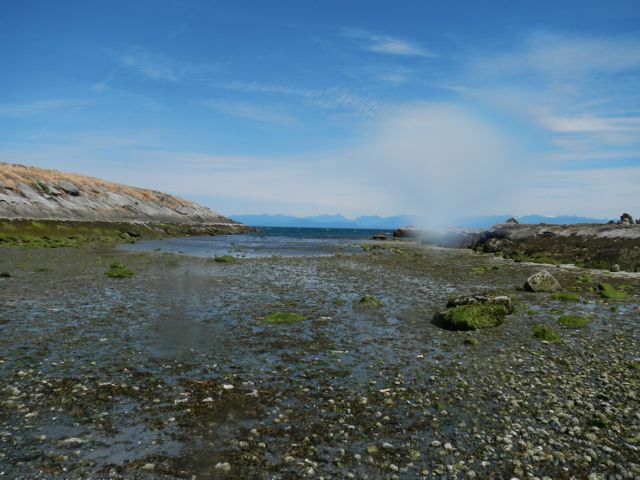 Snake Island is a natural bird sanctuary and we saw plenty of birds, but unfortunately no harbour seals. Once anchored, our captain informed us that due to difficult conditions he was unable to anchor on the other side of the island, where the seals would be found in abundance. This was an unusual situation. We were required to swim approximately 25 metres to the small, rocky island, walk across it and join the seals in the bay on the other side. It sounded easy enough. One by one we slipped into the water after our captain de-fogged our masks and adjusted our flippers. The swim to the island was easy, however visibility was low. Reaching the beach required a scramble over seaweed, rocks and shells (the gloves provided good protection). I felt like I was on another planet. Gravel, rocks and water squelched under my feet as I passed a purple starfish clinging to the rocks. Oyster Catchers and Cormorants flitted from rock to rock. Our waterproof boots were ideal to manage the terrain. I had great difficulty in accessing the bay. Firstly, I struggled with stretching my flippers over my boots. Then, I needed to wade through seaweed, rock and shells. This was a very slippery process and after much slipping and sliding I decided it was too challenging. Only four guests made it into the bay and they were unfortunately unable to see any seals in the water, however could spot them relaxing on the rocks in the distance. While this is usually a popular snorkelling destination due to its abundance of sea life, on this particular occasion the swim was disappointing. The day ended on a high though, with six seals popping out of the water. One seal even displayed its acrobatic abilities, leaping out of the water like a ballerina. The tour takes approximately four hours by the time you are kitted out in your wetsuit until the boat docks. Sundown Diving only provides bottled water, so I recommend bringing snacks. If you're looking for a unique yet potentially challenging snorkelling tour, then this is a great tour for you. I hope the conditions have improved!